MySQL data recovery is a reverse operation for database backup. It creates a copy (or restores an original) of MySQL tables when and where a need emerges. Handy Backup allows automatic, efficient MySQL recovery with minimal efforts, for creating mirrors, replicas, clones and just for recovery. Why It Is Easy to Recover MySQL Database with Handy Backup? Even with single-computer editions of Handy Backup, you can run MySQL restore database tasks for remote MySQL servers accessed by name or IP. It can also use remote storage for recovery. You can select a location to recover MySQL database, set up a schedule, decrypt protected content, make other principal settings and run a completely automated, fully independent recovery task! Handy Backup allows to recover MySQL database in "hot" or "cold" mode, i.e., with or without stopping a server, as well as provides all features available for internal MySQL data recovery configuration. Creating clones of MySQL backup for experimenting, proof-testing, reconfiguring etc. The all-in-one single-server solution, the Small Business edition allows you to recover MySQL database from backup at any local or online server! How to Restore MySQL Database from Files Created by Handy Backup? Here is a short instruction about creating a task to recover MySQL database or to clone it. Note that you must create a MySQL backup dump firstly to complete it with a recovery task. Open Handy Backup. Create a new task and select a restore task on the Step 1. Go to the Step 2and find a folder in your storage where Handy Backup stores MySQL dumps. Select a file called backup.hbi in this folder. Click "Next" to continue. Note: Now you can click "Next" until the final step, and a result will be a task that you can run manually when you need to make MySQL recovery. However, if you want to make an automatic MySQL restore database for cloning or replicating purposes, then you can set up additional recovery parameters! 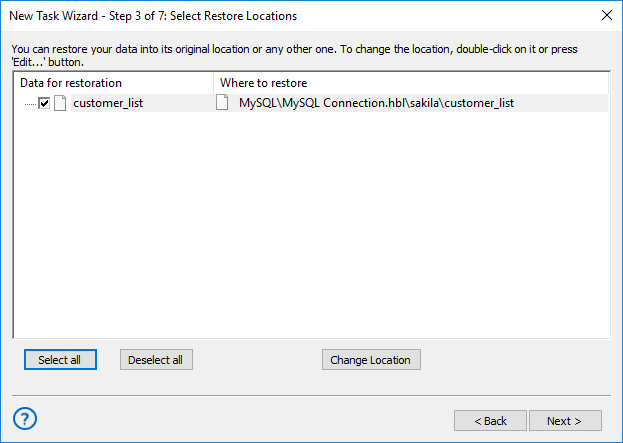 On the Step 3, click "Change Location…" to select a new destination for a MySQL restore task. In the next dialog, select "MySQL" as a destination plug-in. 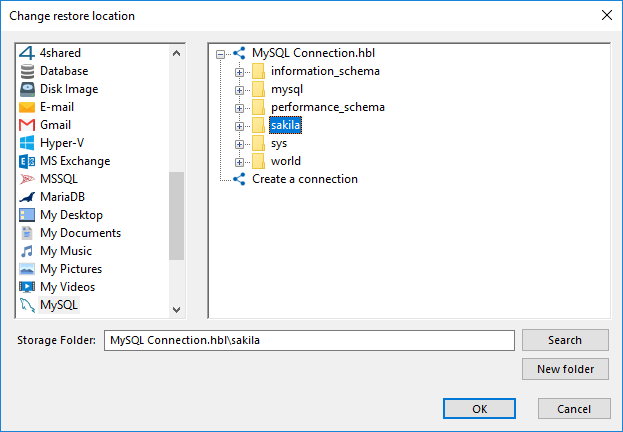 Create a connection for a new MySQL server if you need. Click OK.
Now choose a location for MySQL recovery data in a structure of a particular server. Click OK, then "Next" to continue. On next steps, you can so such things as decrypting a protected MySQL recovery dump. 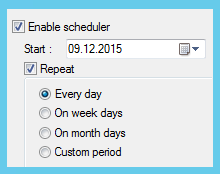 At the Step 5, you may also choose a schedule (starting time and interval) for MySQL restore. As usual, give a name for your task at the final step. That is all! you can need for MySQL data recovery!